Why is everyone comparing celebs to inanimate objects right now? Whether it’s simple statements like ‘I’m baby’ taking on a surreal life of their own, laundry pods becoming a bonafide (if not entirely legitimate) snack option, or lamp-hungry moths infiltrating Instagram feeds en masse, only to vanish as quickly as they appeared, it goes without saying that, over the course of the last couple of years, memes have gotten increasingly weird. Currently in possession of the title of ‘most bizarre’ is one that began cropping up across Twitter earlier this month, and has since taken over the TL. Unless you’ve been living under a rock, it’s likely you’ll be familiar with it: the meme sees celebrities of varying degrees matched up with inanimate objects they resemble (yes, really). In one, Tyler, The Creator is paired with a series of Yankee Candles, while Britney Spears is shown alongside early-00s cell phones. Elsewhere, Kate Bush is matched with everyone’s fave festive chocolate treat (Quality Street, obvs), and, as part of an even more niche thread, Rihanna sits side-by-side with a series of Berlin-based methods of transportation, including yellow U-Bahn trains and buses. 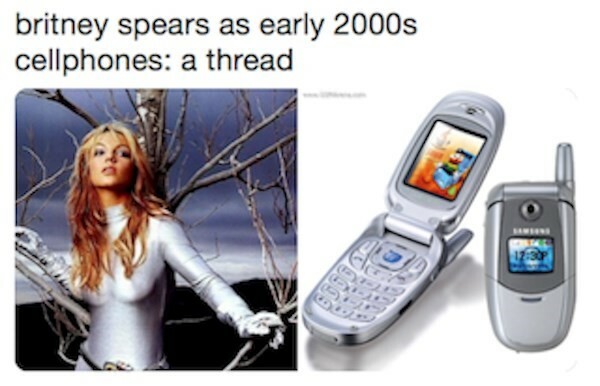 On April 11, the meme was even given Mariah Carey’s seal of approval: having been compared with the simple plastic whisks found at the bottom of basically every utensil drawer in basically every kitchen around the world, Mimi retweeted the thread to her 21 million followers with the caption ‘Whisk me away dahhling’ (we stan a punning queen) – with the tweet gathering over 380 thousand likes. But where did the trend come from, and why is it suddenly everywhere right now? Well, it’s not the first time people have compared their fave celebs with random, inanimate objects. Back in late 2016, the internet at large noticed the similarities between a particular dress worn by Beyoncé and popular green tea-based soft drink Arizona, and lo, a meme was born. Soon after, Ivanka Trump was memorably compared with a foil-wrapped burrito while wearing a silver Carolina Herrera gown to a black tie event in early 2017, Since then, the idea has bubbled under the surface until it exploded in early April, with an image of Troye Sivan placed next to varying toothbrushes among the earliest images this time around. As for why these threads are suddenly so popular, in truth, there’s likely no real reason behind it – other than their sheer lols-inducing absurdity. Dotted between the posts speaking of worldwide political unrest, climate terror, and human rights violations that dominate the timeline, comparing Jeff Goldblum to a Pop Tart or Lady Gaga to a microwave offers a bizarre moment of respite – and, sometimes, that’s all we need from a meme. Here’s some of our favourites.